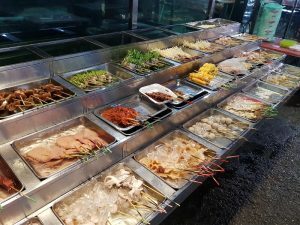 What to do if you have only 8 hours in Johor Bahru? You have probably walk around your heartland malls a million times and Orchard Road is getting too expensive for a satisfying shopping trip. You want to make good use of your passport but you have used up all your leave days to fly to somewhere else. How about a day trip to Johor Bahru which is just across the causeway? If you do not have a car to drive in, the other option would be to go in by foot/feeder bus. AND we all know the queue at the immigration checkpoints is enough to turn anyone off. However, if you are able to make your plans early, it is ALWAYS worth it to get the train tickets that will take you from Woodlands Train Checkpoint to JB Sentral. It saves you so much time and it’s stress-free! 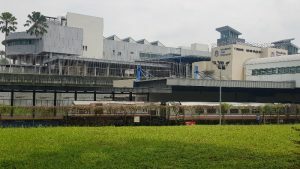 Check out our article here on booking the KTM tickets between Woodlands Train Checkpoint and JB Sentral! After getting off the train, we approached the main entrance to wait for our Grab. You can also get a taxi but they might reject passengers who are going to nearby places only. We got a Grab easily and set off to our first location, Mok Mok Brunch & Bistro. It is about 10 min – 15min drive from JB Sentral and the Grab cost us about RM 7. After we got off the Grab, we found ourselves in the middle of a neighbourhood but the signboard immediately caught our eyes. 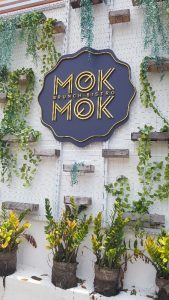 The entrance and interior of Mok Mok Brunch & Bistro are beautifully decorated with lush greenery. We felt like we stepped into a garden when we entered Mok Mok. A quiet weekday afternoon at Mok Mok. The owner of the cafe is also thoughtful enough to include in beautiful backdrops for your OOTD photos. The service staff was not only enthusiastic in helping us take a picture, she was also pointing out other areas in which we could take pictures in. We were absolutely spoiled for choices as we flipped through their menu for something to fill our tummies. 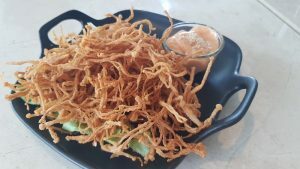 Their menu consisted of rice bowl, brunch, burgers and desserts. We ordered a Fried Mushroom (RM12) for sharing. 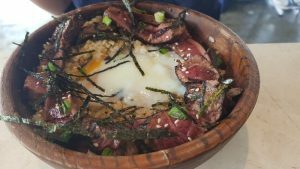 The Australian Beef Tenderloin Rice Bowl (RM 39), we mix the onsen egg in with Mok Mok’s signature rice immediately when it was served. We were also rather excited to try their recommended dish, Gyutan Rice Bowl (RM 28). 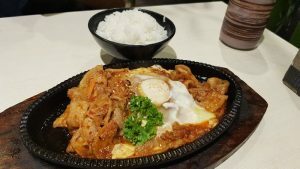 It came with thin cuts of meat, topped with chilli and spring onions, served over their signature rice marinated in chili sesame oil and shoyu. 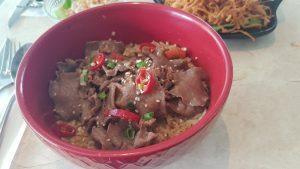 FYI, Gyutan is beef’s tongue so if you love to try something new, this is definitely for you! We ordered their signature Milk Tea Kumo Ultimos (RM 20) to complete the meal. I love how the ice-cream matches the fluffy soufflé pancake and this dessert even comes with black pearls! Unfortunately, the milk tea flavour did not come out as strongly as we expected it to be. Nevertheless, we enjoyed the dessert to the last bit even though we were rather full from the rice bowls. At the end of the meal, we wished we could spend more time in Mok Mok. Surrounded by the greenery and laid-back ambience, it is a perfect place for a date, a gossip session with your besties or just some “me” time. 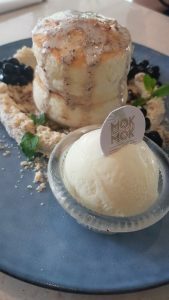 The service staff were also very attentive and polite so we felt right at home in Mok Mok. 3.15 pm: It’s Pampering Time at Holiday Plaza! After lunch, we decided to treat ourselves to a hair treatment. 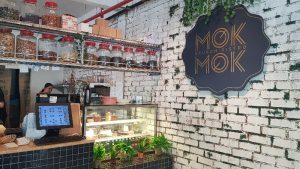 We took a Grab from Mok Mok Brunch & Bistro to Holiday Plaza. 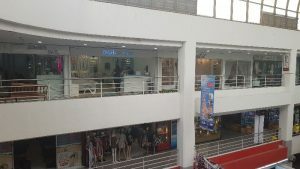 Even though the Mall might look old from the outside, it is a paradise for those who are looking for a good afternoon of pampering. There are numerous hair salons, nail salons and massage parlors to choose from! If you are looking for handphone accessories, this is definitely a go-to place too! Holiday Plaza, a paradise for those who are looking for a relaxing afternoon. We took some time to walk around level 3 to choose a hair salon. The prices are quite competitive so we were just looking for a salon which we feel might look quite comfortable in. Finally, we settled for one, asked for the details of the type of hair treatment which they offered and most importantly, the price. It is always important to negotiate and confirm the price before starting the treatment to avoid any conflicts which might arise later. 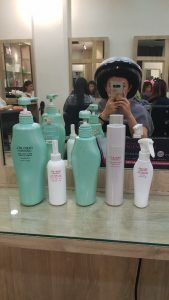 I opt for a 6-steps Shiseido Hair Treatment which to be done on my scalp and ends of my hair. The treatment took about 1 h 45 min and cost me RM 190. I was very satisfied with how smooth my hair felt at the end of the treatment. 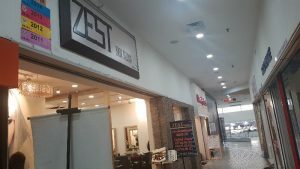 There are also a handful of shops in Holiday Plaza which also act as distributors for the products used in hair salons. 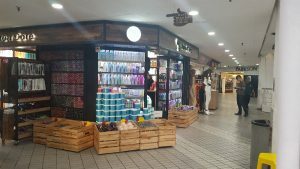 We dropped by one of these shops to stock up on some hair products. 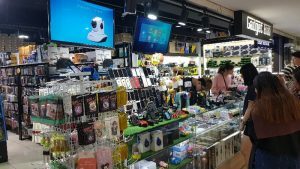 We also replaced our screen protectors in one of the many handphone accessories shops in Holiday Plaza. There are also many shops here which offer phone repairs at an affordable price. 5.30 pm: It’s Shopping Time at KSL! What is a trip to JB without some shopping? KSL is just a 10min walk from Holiday Plaza! 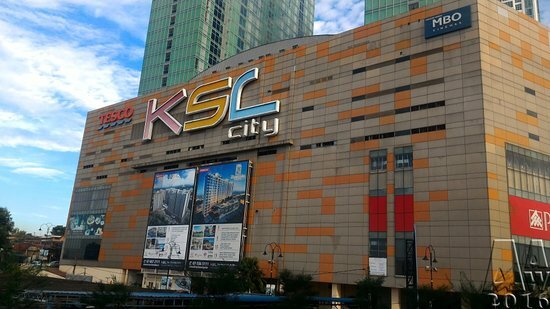 Unfortunately, we visited KSL on the day when there was a power outage in JB so most shops were closed. I usually stock up on the cuttlefish snacks for my family and coloured contact lens for myself. 6.30 pm: Dinner before Home Sweet Home. 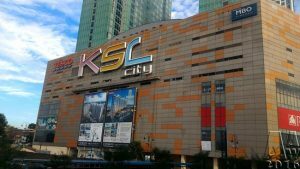 Right before taking our train back to Singapore, we visited Johor Bahru City Square, which is right beside JB Sentral, for the last round of shopping and dinner. There are more known and bigger brands in Johor Bahru City Square like Cotton On, F.O.S, H&M and etc. 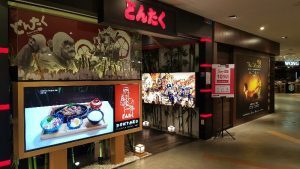 We had our dinner at a Japanese restaurant, Dontaku, located at Level 3 in Inner City. I had the Ramen with Wagyu Beef (RM 48). 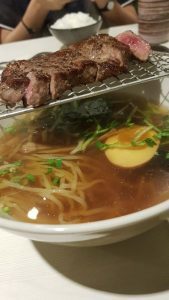 While there is nothing special about the ramen, the wagyu beef was quite tender and flavourful. We did have to wait quite a bit for our food which made us rather nervous as we had a train to catch. Beside that, we enjoyed the food which was of rather affordable price for a Japanese restaurant. 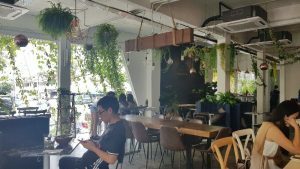 However, we noticed that the Sales and Service Tax (SST) was added to the final bill so you might want to keep that in mind while dining in JB. 8.15 pm: Catching the train back home. We did have to rush a little to catch the train (and sadly, did not manage to get Cheesecake from Lavender Bakery) but we managed to reach JB Sentral on time. (P.S. Cross over to JB Sentral from Level 3, near Uniqlo) We got back to Singapore by 8.30pm with a bag full of shopping and great hair. 8 hours is definitely not enough to fully enjoy what JB has to offer. We will no doubt try to get an earlier train ticket in next time.